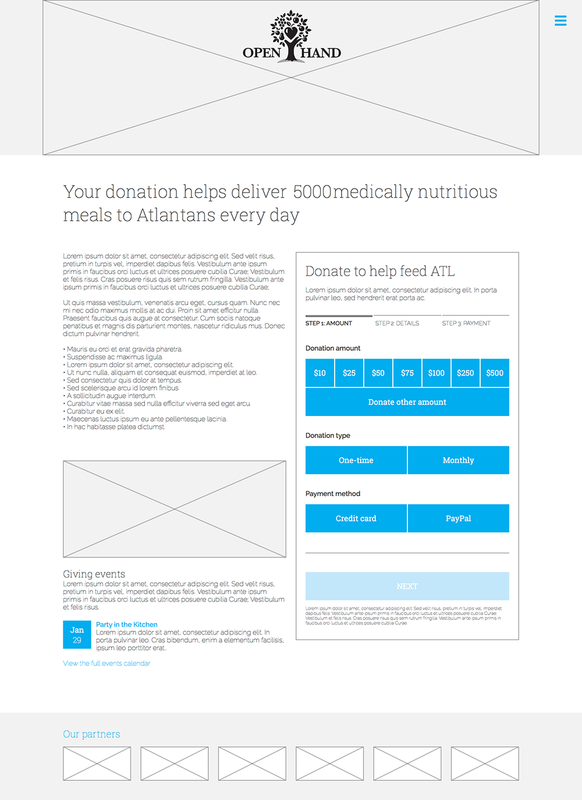 Open Hand Atlanta—a non-profit that prepares and delivers medically-nutritious meals to those who can't feed themselves—needed to do more than just redesign their 10+ year old website. They needed to reimagine how a new generation of volunteers and donors interact with their content and their brand. So J+E joined forces with Open Hand's internal marketing team and created a new website that was much simpler, both in terms of the site’s message and its structure. Simplifications that make the site more timeless, easier for staff to maintain, and effortless for users to browse, donate, and volunteer. The new site also introduces a new content strategy. Engagement is all about outcomes, after all, so their content focuses on both stories of those they help and those who help them. Small, personal, shareable stories users can read in a blink on smartphones or get lost in for hours. The new Open Hand Atlanta website paints a clearer picture of the non-profit's tremendous impact on Metro Atlanta—and the 5,000 people they feed daily. Our rigorous design-thinking approach began by talking to stakeholders, researching user needs, testing the current-state website, and exhaustively researching non-profit innovations. Donors and volunteers typically only engaged with Open Hand when giving or attending events, disassociating with the clients, their efforts helped serve despite a shocking demographic overlap in geography and culture. The legacy website was sprawling—creating content challenges both for users and for the staff that maintained it. Third-party sections of the site dramatically deviated from non-profit industry norms and from the intended website design, creating a fragmented user experience. Mobile-centric design drove a modular approach that let us create interactions that don't change across platforms even as their surrounding layouts respond to different form factors. Donor and volunteer engagement are priority—and not just once off, but recurrently. Make donating and volunteering not just easy, but mutually referential to help convert users of one segment to another. Streamline the amount of content and how it's navigated, focusing on only the most important narratives that reinforce the brand the the hither-to obfuscated community identity Open Hand serves. Make use of interaction patterns that don't change from desktop to mobile. Usability testing began almost as soon as stakeholder interviews were complete. What worked, what didn't, and how might both interactions and content measure up to both user and business needs. Giving users more visible and more usable means to donate, volunteer, and attend events increased user engagement and helped users better give what they were able. Platform testing identified the platform that combined ease of maintenance and design fidelity (tl;dr: it was WordPress). New content expanded Open Hands story and better painted a picture of their involvement in the wider metro-Atlanta community—ranging from downtown to the burbs and even as far as Athens. 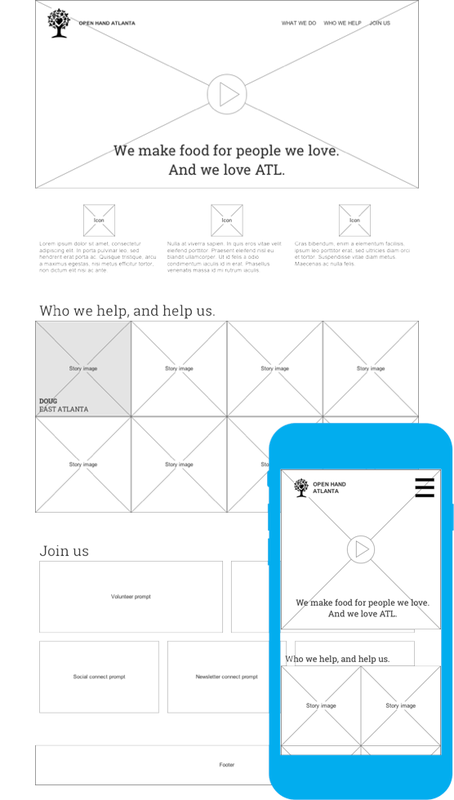 The former Open Hand Atlanta website was non-responsive and a legacy technology amalgam. In addition to phantom nav links and unclear navigation, third-party donation software splits donation types contrary to best practices while a third-party volunteer portal featured a different UI, voice, and overall experience. And it does this across a full-responsive, modern website that pairs mobile design modularity and navigation conventions with rich video, photographic, and written content. Navigation tells Open Hand Atlanta's story at the highest level, telling new and veteran users the story of their service and always showing them how to help. From the very first sketches and low-fi wireframes, mobile and desktop we designed side-by side for consistency of interactions and content strategy. High-fidelity wireframes served both usability testing needs and demonstrated front-end development specifications. Final visual design and front-end development happened in parallel, streamlining the process and facilitating advanced platform testing. Open Hand Atlanta also had the opportunity to reconsider the way donors and volunteers interacted with them online and on mobile devices. Typically, transactional and scheduling experiences are limited by off-the-shelf offerings. 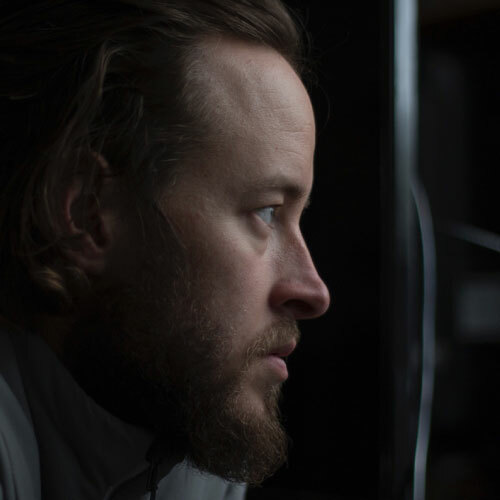 But by stepping back to user research and exploring options without technical requirements, J+E was able to solve a wider variety of user pain points—particularly those surrounding checkout—while simultaneously creating new opportunities for engagement and conversion. The resulting module approach allowed a simpler, uniform donation experience to be dropped into any page—desktop or mobile—and even syndicated to partners. It also hands users off to a companion volunteer module. Engagement is all about outcomes. Both for our clients and for those who help them. So our content focuses on the stories of those we help and who helps them. Small, personal, shareable stories we can read in a blink on our smartphones or get lost in for hours. These stories connect our donors and our clients in local ways—showing them what our data demonstrates: our donors and our clients represent all the communities that make up metro Atlanta, from downtown all the way to College Park and Athens. Paired with social media hashtags—where donors and volunteers keep the conversation going—and by working with local photographers and videographers, we ensure a catalogue of high-quality and highly-promotable content for use across all channels. They call it “the suicide of youth.” I never thought it'd happen to me. But I've had AIDS for three years now. My whole world has changed. Most days it feels like I'm in a fish bowl, staring out at everyone else living their lives, and I'm just stuck. I started cooking for Open Hand because of this kid on my block. He'd always be asking "You gonna finish that" when I was eating an apple or a sandwich—anything really. Turns out his mom's sick and he was giving her all his food so she could get better. Now he doesn't have to. When I volunteer, I know who I'm helping. It makes me happy, knowing I'm helping someone's somebody. Every person I bring food to is someone's mom, dad, grandma, grandpa, sister, brother...somebody! He showed me memorabilia from world war 2, and from when he worked in the railroad industry. It absolutely broke my heart when I left, because it was obvious he wanted someone to talk to. If I weren't on the clock, I would have stayed for hours. Brands don't end at the edge of the screen—or even of the margins of a phone. 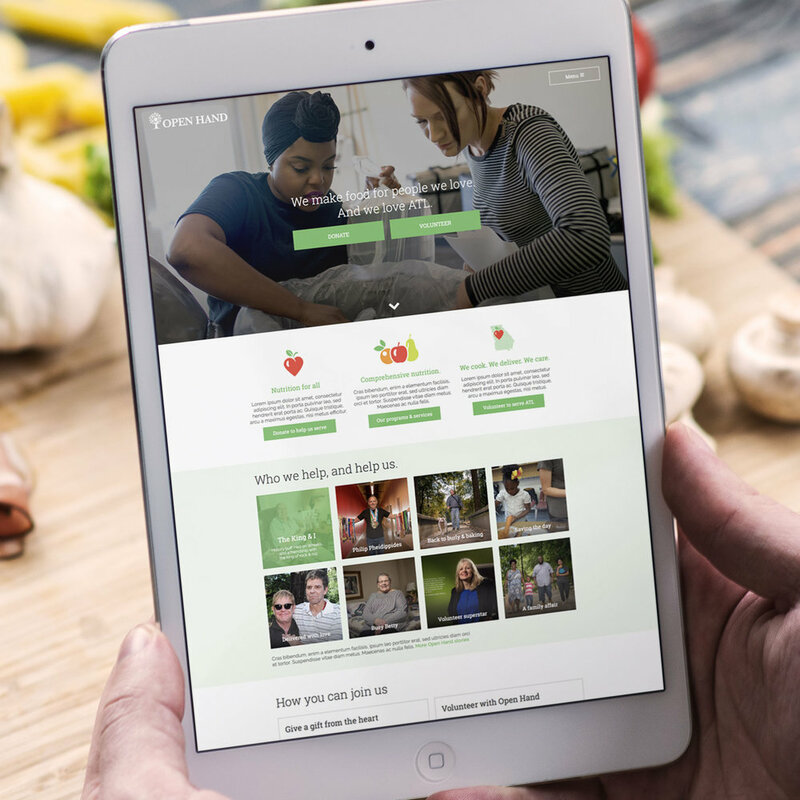 Brand awareness is the lifeblood that keeps any non-profit alive and serving, so we matched online efforts with offline tactics to help inform the community Open Hand Atlanta serves about their medically-nutritious mission and the breadth of their scope. Because while Open Hand Volunteers are busy feeding 5,000 Atlantans a day, they don't always have time to evangelize. But through passive communication, their actions can speak volumes. And their clients can feel a little less alone. Small, inexpensive stickers can be mass-produced and given out to volunteers, in mailings, at events—anywhere. And they’ll end up anywhere! Given out to volunteers, these tees will have presence in photos and lasting value in wardrobes—even if just as exercise wear—spreading brand awareness. QR codes that help drivers map to meal recipients also reinforce client relations and reinforce branding. The cars and vans running meals around town everyday—volunteer and staff vehicles—are prime platforms to spread Open Hand’s message and brand. Donors of a certain level can be rewarded with small lapel pins after their first donation. And annual recognition pins after 5, 10, or more years of support.